"Never Again. 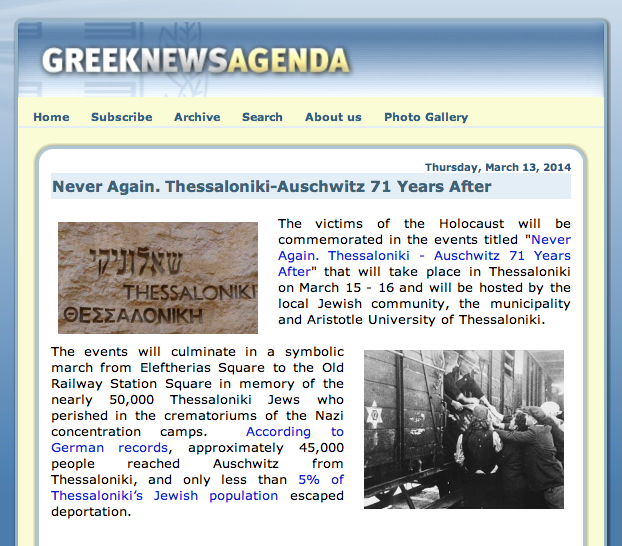 Thessaloniki-Auschwitz 71 Years After"
The victims of the Holocaust will be commemorated in the events that will take place in Thessaloniki on March 15 - 16 and will be hosted by the local Jewish community, the municipality and Aristotle University of Thessaloniki. The events will culminate in a symbolic march from Eleftherias Square to the Old Railway Station Square in memory of the nearly 50,--- Thessaloniki Jews who perished in the crematoriums of the Nazi concentration camps. According to German records, approximately 45,000 people reached Auschwitz from Thessaloniki, and only less than 5% of Thessaloniki's Jewish population escaped deportation. You might also be interested in the 22 other posts in the Hellenic Genealogy Geek blog that are related to the Jewish community in Greece.